Ankylosing spondylitis can result in two different types of fractures: compression fractures as part of osteoporosis and transverse fractures. May occur in all stages of the disease and contribute to the thoracic kyphosis often seen in AS. These fractures are usually stable and rarely cause spinal cord injury, though impingement of the cord may occur. 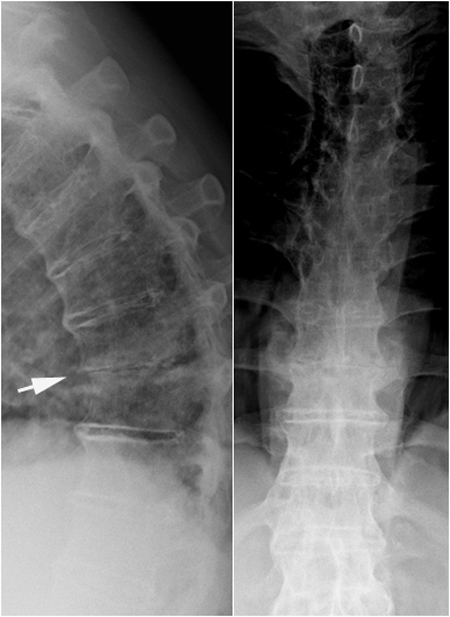 AS patient with thoracic kyphosis developed progressive pain in the lower thoracic region without preceding trauma. 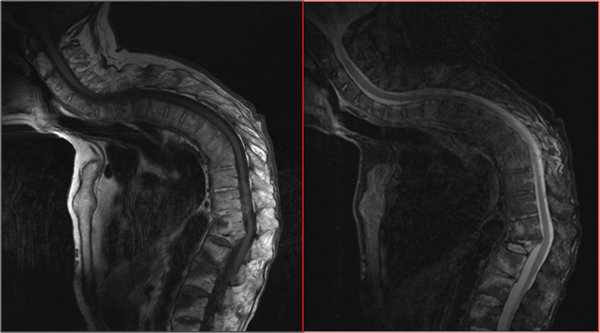 MRI of the thoracic and cervical spine (T1 and STIR sequence) shows pronounced osteoporotic collapse of Th12 with dislocation of the spinal cord. Mainly occur in ankylosed spines in late stages of AS. They are caused by trauma; occasionally patients do not remember having had a trauma as they can be minimal and result from a fall from standing or seating position. 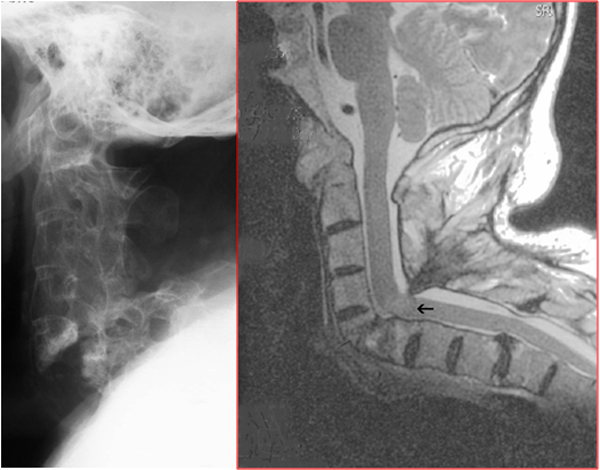 Transverse fractures are most frequently located to the lower cervical and upper thoracic spine. They pass through ankylosed intervertebral spaces or vertebral bodies and will not always respect normal anatomical clivages. They may cross the spine horizontally or obliquely through several vertebral bodies. The posterior structures are usually involved, including the apophyseal joint region and ossified ligaments making the fracture site unstable. Thus, fractures of the stiff spine resemble fractures of tubular bones with a potential for dislocation. In the spine, this instability carries a risk for serious spinal cord or nerve injuries. The Danish (and other national) Ankylosing Spondylitis Society and the Ankylosing Spondylitis International Federation (ASIF) therefore recommend that patients carry information cards about their illness, including a photo showing the normal posture of the person. This must be considered by paramedics, emergency room physicians, radiographers etc. in cases of suspected fracture. A direct or indirect spinal trauma, even minor trauma. Newly onset of mechanical back pain that is triggered or worsened by activity and completely or partially relieved by rest. Changes in posture; if necessary check photo of the patient on the information card. Occurrence of new neurological symptoms (even weak). These can occur immediately after a trauma or be delayed for hours or days. Manage the patient as having an unstable fracture until the diagnosis is excluded. Avoid the use of rigid cervical collar, if it does not immediately fit the patient's shape. Do not attempt to correct a kyphotic spine. When positioning and moving the patient, support the entire spine in the position present before the trauma. Conventional radiography in at least two planes is often the initial examination. It can be used to diagnose osteoporotic compression fractures and show obvious transverse fractures. 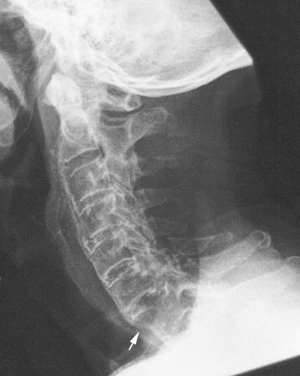 Conventional radiography can thus only contribute diagnostically if there are positive findings such as slight misalignment between the vertebrae. 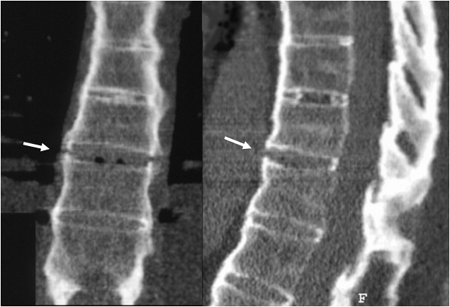 A simple fracture of a spinosus process also points with high probability to the presence of a transverse fracture (Koivikko & Koskinen 2008; http://www.springerlink.com/content/32632r1h15140931/fulltext.pdf). 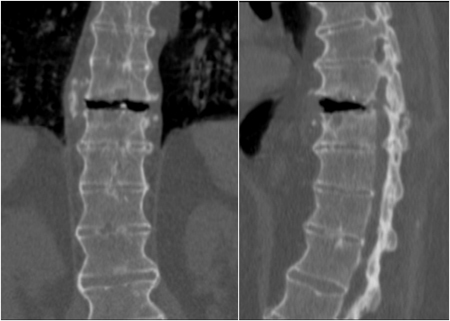 CT performed in supine position, coronal and sagittal reconstructions clearly show the fracture through the intervertebral space and the posterior structures. In this position the intervertebral space opens anteriorly with concomitant space reduction of the spinal canal. 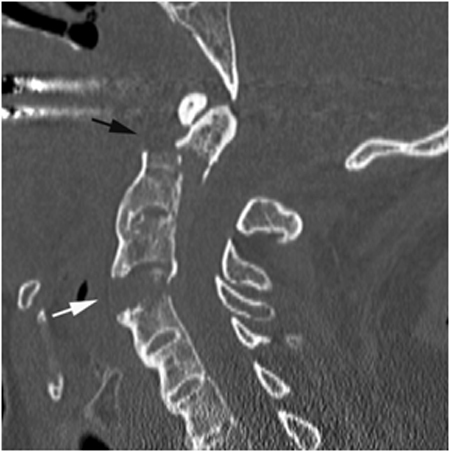 Most fractures are cervical or at the cervico-thoracic transition where fractures can be difficult to detect by radiography due to overprojecting shoulders. Besides, the occasional occurrence of pronounced kyphosis can impede an optimal frontal view. In this region CT is therefore the preferable initial examination. Is often necessary to confirm the diagnosis of transverse fractures and/or delineate the osseous structure before surgical intervention. The examination should be conducted as a multi-slice CT (MSCT) with multiplanar reconstructions in relevant planes. MSCT is superior to conventional radiography in the diagnosis of fractures, especially if the scan is performed with high resolution (Harrop et al. 2005; http://www.ncbi.nlm.nih.gov/pubmed/16025019; Jacobs & Fehling 2008; http://www.ncbi.nlm.nih.gov/pubmed/18290738. Be aware that there may be more than one fracture, especially in patients with obvious trauma. Is always indicated in patients with neurologic deficits. It can visualize spinal cord injury and hemorrhages, most importantly epidural hemorrhage, often necessitating emergency surgery (Koivikko & Koskinen 2008; http://www.springerlink.com/content/32632r1h15140931/fulltext.pdf; Campagna et al 2009; http://www.ajronline.org/content/192/4/987.full.pdf + html). 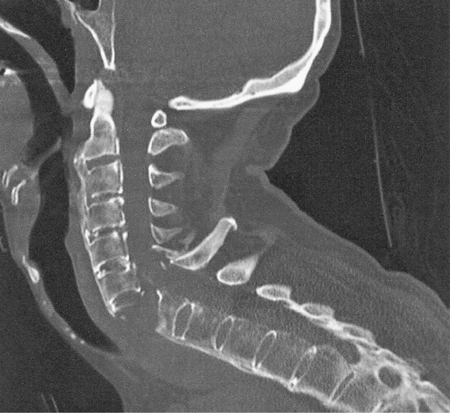 Fracture in the cervical region causing neurological deficits (paresis). 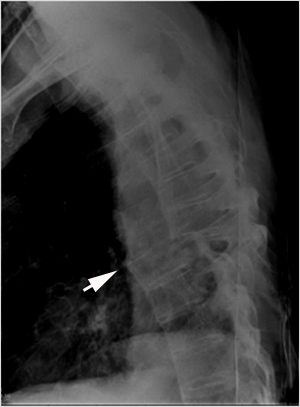 Besides the fracture there is hemorrhage in the spinal cord corresponding to the angulation area (arrow). 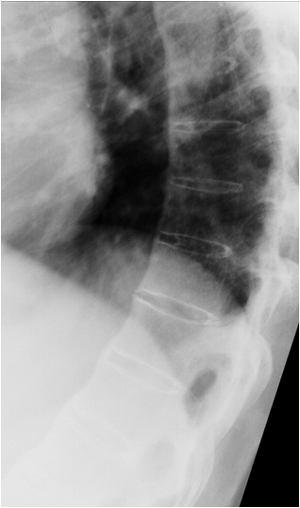 Part of this may be caused by inappropriate stabilization in a position “not normal" for the patient; please see the first patient illustrated with transverse fracture.